My criticism of Amazon is about an issue perhaps more subtle, but, in my view far more serious. Amazon has destroyed the publishing industry by destroying its well-honed ecosystem. Sure, all of the other issues and criticisms stay on the table. This issue is for me the heart of darkness of our beleaguered industry. Beware: there’s an heavy dose of data in what follows. I hope that if you stick with it you can decide whether to cheer or have me pilloried. Consider the auto industry. After some tough years in 2013 a recent record was set: 15.6 million vehicles sold, both U.S.-made and imports. Current projections are for further increases in 2014. Do you think that this excitement will move car companies to triple manufacturing and imports as a result? Consider next the forest industry. The uses of wood are numerous, mostly construction, paper for publishing, packaging and household products such as tissue, paper towels and so on. After a very tough decade the industry had a good year in 2013. I think it remains unlikely that forestry companies will cut down five times as many trees as 2013 just in case sales suddenly explode. Yet somehow in the book industry, despite a modest growth in the number of readers and the number of different titles they read, the number of new titles issued has exploded. Bowker’s very savvy Laura Dawson points out that output increased between 1998 and 2012 from roughly 900,000 active titles listed in Books in Print to 32 million. That’s an increase of 2.3 million titles per year. And as Dawson admits, many self-published titles no longer carry ISBNs because they’re expensive to obtain in small quantities and many self-publishers perceive little or no value in them. So when you add in the “non-ISBN” self-publishing rate the total titles published is even higher. I can’t find exact comparable growth rates in the other industries I’ve mentioned but here’s a for instance: The US new car market had total revenue of $174.4 billion in 2009, representing a negative growth rate of -5.4% for the period spanning 2005-2009. The US forest products industry had total revenues of $84 billion in 2012, experiencing a negative growth rate of -1.8% between 2008 and 2012. Now to bring book publishing industry stats into focus against the two large industries above, I’ve got two charts from The Book Publishing Industry, 3rd edition (by Albert Greco et al.). The first covers title output from 1940 to 1990; the second from 1991 to 1999 (they’re large, but clickable). 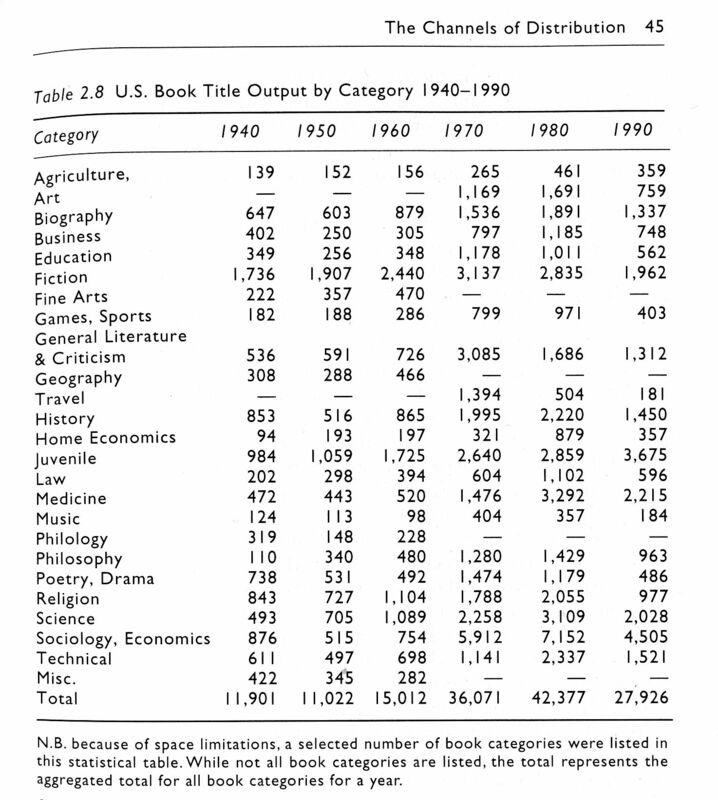 In that nearly 60-year period ten times as many titles were published: from 12,000/year in 1940 to 120,000/year in 1999. The U.S. population grew by 2.1%, from 132 million to 281 million in the same time frame. A second difference was literacy. Overall school enrollment rates for 5- to 19-year-olds rose from 75% in 1940 to roughly 90% in the early 1970s, and then to 96% by the late 1980s. In higher education the data shows that 7.3% of men and 5.2% of women completed 4-year college degrees in 1950. By 1991 the numbers had risen to 18.2% and 18% respectively. This is where my publishing ecosystem theory enters the narrative. 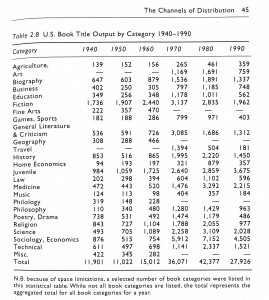 In 1940 12,000 new titles were published and offered to a population of 132 million (there was near 100% literacy). If one out of each 12,000 literate readers bought a copy of one of the new books each title would have earned a customer. If publishers hoped that a new title would sell on average 125 copies per year, then one in nine Americans would have to purchase a copy. Fifty-nine years later, with a U.S. population of 281 million, 2 people would have to purchase one of 125 copies of each of 120,000 books published. Hardly a situation that’s gone out of control. 252,654 Number of Kindle titles published on Amazon in the last 90 days. Based on this data there are upwards of a million new Kindle books published on Amazon each year. That’s one per 32 Americans. Except that only half the population reads books. Less than 85% have English as their primary language. 20% are 14 years old or younger. This is not your parents’ publishing market. 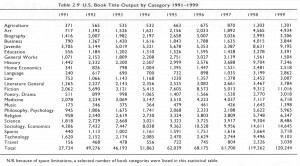 Before the Amazon Kindle there was a relative equilibrium between supply and demand in the American book publishing industry. The system largely functioned as designed. Sure there were some remainders. Sure there were some titles left sitting on publishers’ bookshelves that sold a single copy once every few months. But the business continued to grow. Publishing folk made a decent living, and book publishing and bookselling helped to define culture in English-language markets. How Can Prize-Winning Books Remain Invisible? Here’s my next datapoint. The Independent Book Publishers Association (IBPA) is a not-for-profit membership association serving the independent publishing community. Among their numerous activities they’ve offered the Benjamin Franklin Awards for print books for some time now. They recently added the Benjamin Franklin Digital Awards to honor innovation in electronic book publishing by individuals and organizations of all sizes. I’m all for it. IBPA is a good trade group and they work hard for their membership. It’s hard to say exactly what a bestseller is on Amazon because its rating system is based on sales velocity rather than on overall sales. Gernerally speaking when I see a title at 10,000 or lower I think it a success. Once it slips below 100,000 it has usually fallen into nowhere land. My point is simple: A reputable publishing group offers awards to some of its members’ best titles and yet can’t really move the needle on those books’ sales. If these awards can’t help sales, what can? For this I damn Amazon. Who are they trying to help besides their own ruthless enterprise? If this is how we must paint the future, I’ll take my pictures from the past. The industry’s worship of this firm makes me nauseous. There are two aspects as to how many movies were released in the U.S. in 2013. There were roughly 150-U.S. produced films plus 725 foreign films. Let’s stay with the 150 U.S.-produced films. If you were a madcap film junkie who wanted to see every U.S.-produced film regardless of reviews, stars or subject matter, you could manage the task at 3 movies/week. What if Amazon found a way to fund 5,000 new U.S. films each year? You’d suddenly be facing the challenge of watching 14 new films each week. How about 50,000 new films? My head spins. I think this is the equivalent of what Amazon has done to books. To take on Amazon’s one million books then you’re going to have to pour over 83,000 titles per month. The industry has absolutely no way of absorbing this title output. It’s not just prize-winning authors who disappear from the radar. Let’s accept the truth: the average author doesn’t have a hope in h-ll of making more than a pittance. The remaining retail book chains continue their slow decline (and move into toys and games). College bookstores are losing single-digit volume each year. Startups are wasting their founder’s cash. Amazon has begun to turn the increased margin screw on its creative providers. Sony’s bookstore just headed over to Kobo who no longer can afford to have a U.S. prescence. Anyone who argues that Amazon is just a logical and healthy outcrop of the capitalism and competition should just join the Libertarian Party and share their insights with like-minded individuals. It is an enormously successful dot.com, but its success is at the same time destroying the traditional equilibrium in book publishing, making the business untenable for all but a small fraction of successful players. This is an unjustifiable debacle. The difference is that the rest of us, with different tastes and different beliefs, can ignore Upper Manhattan. We can’ ignore what Amazon does or doesn’t do. It’s too big and too pervasive. To give but one example, Amazon’s search engine is biased, displaying certain titles and concealing others. When I lived in Seattle, i was told just that by two Amazon employees. An Amazon lawyer defended the practice. An Amazon software developer told me to never trust its search engine. At present, money seems to be Amazon’s primary motivation, but they could just as easily be driven by their tastes or by a political agenda. It’s also unfair to blame Amazon for the huge glut of ebooks. That’d have happened with or without Amazon. In the case of ebooks, the company merely got into the market early and with more zeal than companies such as Sony. But if it hadn’t, someone else would have. No, the real harm that Amazon is doing to the publishing ecosystem is one I’ve mentioned numerous other places. Behind a confusing system of royalties and download fees, it’s paying authors and publishers less than almost anyone else in the industry. And it’s recent reductions in the royalties paid audiobook creators hints that it’d like to do the same for ebook creators. My hunch is that, instead of paying a flat 70% like Apple does for ebooks, music, and apps, it’d like to pay in the 40-50% range. For struggling writers, that difference is a painful one. Amazon also has a too-inflated sense of its role in the writing-editing-publishing field. It’s already dubious when a retailer takes on the role of a publisher. It’s far worse when it assumes the role of publisher even when a book is being written, edited and published by others. You see that in all the various ways that Amazon insists on dictating prices and terms–dictates that show that it ‘ain’t got a clue about all the complexities of publishing. The illustration I often use is Amazon vicious but lucrative bias against ebooks that cost over $9.99. Some books, textbooks and those with specialized and often professional markets such as nursing, need to charge more than $9.99 to recoup their costs. And yet the instant the price rises about $9.99, Amazon slashes their royalties to 35%, with every bit of that reduction going into its pockets. Do the numbers and you’ll discover that for an author or publisher to make a penny more from a book sake than it earns at $9.99, the books has to be priced above about $27, almost three times as much or a 300% rise in the cost. That inflates the cost of books and textbooks. It shortchanges speciality authors and publishers, and it cheats book buyers. Yes, you can call that greedy, and it is. You can call it ignorance about the intricacies of publishing, and it’s that too. But in the end Amazon as a book retailer simply doesn’t give a rip about books. For Amazon, they’ll simply a commodity not different from socks and diapers. And that attitude no doubt flows from Jeff Bezos himself and, if fact, there are remarks he’s made that say just that. Oscar Wilde described Amazon’s attitude toward books to perfection when he wrote of someone “who knows the price of everything and the value of nothing.” That’s where Amazon is doing real harm. The sheer quantity of ebooks is makes available is irrelevant. Many people argue that point, which whether intended or not is a defense of Amazon. I’m not convinced that ebooks, at the scale we’re seeing them, were any sort of historic inevitability. Just look at Barnes & Noble’s many failed efforts, and Sony’s and Apple’s (though now somewhat improved). It took a wealthy and very smart executive with a unique sense of determination and a frightening willingness to incur huge losses to reach his target. Disruption of a wide range is Amazon’s game, and they play it masterfully. I’d lose no sleep finding the retail mattress industry completely disrupted: that’s far overdue (I suppose I’d even sleep better!). But going after book means going after the culture of a country and a language in exchange for money that could well be earned in other ways. Sucking up to writers and readers is like leaving a juicy bone out for a starving dog. You’ll hear no complaints even if the expression of gratitude is poorly framed. I appreciate your thought-provoking comments. I never think of the six largest publishers as the core representatives of “the publishing ecosystem.” Of course they are a part of it, but they really operate their own game. Look at PW’s “The World’s 60 Largest Book Publishers, 2013” (http://www.publishersweekly.com/pw/by-topic/industry-news/financial-reporting/article/58211-the-global-60-the-world-s-largest-book-publishers-2013.html) and you get a completely different sense of the largest players in the publishing ecosystem. If you restrict your focus to just textbook publishers operating primarily in the U.S. you’ll find sales declines, company splits and two major bankrupties, all in the last few years. I wouldn’t say either that these companies tell the whole story of the publishing ecosystem, only that the story is more complex than the big six (and keep in mind that they are now the big 5). As to ebook sales mitigating sales at the big 5, I consider that a shell game that will be hard to sustain. The public announcements from these companies are of course self-congratulations about their skills in navigating these rough waters. But I want them to next explain why they have nearly lost their marget dominance in the category of ebook publishing and how they see this playing out three years from now. Amazon has destroyed the publishing industry by destroying its well-honed ecosystem. – See more at: http://thefutureofpublishing.com/2014/03/how-amazon-destroyed-the-publishing-ecosystem. The buggy-whip industry said the same thing when the automobile came along as did the slide-rule industry when calculators came along. The lesson is clear. Adapt or disappear. Whining won’t help. I’m not arguing that ebooks, ebook readers or tablets are bad things that should be removed from the market to protect hardcover and paperback publishing. You’re comparing manufactured products of generally pre-determined cost and demand. These (very valuable) products do not contribute to our culture, and you have to decide for yourself how important it is to you to have a workable book-based culture (one which augments online learning). Cultural product are unpredictable in their demand. One very smart and aggressive company (Amazon) has invented a way to create a new books for well under a dollar, and so millions are being created. But the market can’t absorb that much title volume, and it will collapse. It’s hard to predict what the post-apocalyptic book authoring and publishing industry will be like. I’m think it will be very, very quiet. Amazon doesn’t create books. It sells books others have created. If the ecosystem is being destroyed, it is being destroyed by authors doing all that creating. If you don’t want them to create, just say so. Then tell us who should. I think that’s an interesting perspective, but I beg to differ. When there are discussions of addictions we refer to enablers, whether they’re friends who encourage the addiction, bars that draw you in with happy hours and two-for-one specials, and so on. I see Amazon as an enabler. It makes it simple to post books regardless of quality and regardless of whether the content even resembles what we think of as a book. It offers to pay far higher royalties than traditional publishers, if you keep your retail price unreasonably low, and though few authors will earn any royalties to speak of. It offers exclusive programs that purport to increase your earnings by allowing Prime members to borrow you book(s) for free while you still earn a royalty. And other features too long to list here. Authors: create away. I do not seek to discourage any author or group of authors from publishing their “book(s)” on any web site at any price for as long as they like. It’s no single author’s fault. But authors beware. Amazon has taken you in. It implicitly promises good things that will almost never happen. And along the way it is the prime instigator of the publishing industry’s (current) greatest problem: The supply of bookish publications now vastly exceeds the demand. So vastly that even if all the books were worth a read, no one could possibly do so. I find it very sad. Well, if you do not discourage all those authors from writing and selling all those books, what are you complaining about? The oversupply of all those bookish publications is because all those authors are writing and selling them. It doesn’t make much sense to complain about an oversupply while encouraging authors to keep oversupplying. If it is sad that books are not read because of oversupply, why encourage authors to supply more? If it is very sad, stop encouraging more supply. It’s not for me to tell any individual what to do or not to do. I’m not encouraging authors to jump into the mud puddle, but nor would I forbid them. I’m just trying to caution authors of the much more harsh realities of publishing today. Thanks for writing. I think they know its harsh, and they still keep writing. I don’t expect it to stop. Authors kept submitting to the traditional publishing slush pile with a very low probability of being published. That didn’t stop. Some were published, but the vast majority never left the slush pile. Individual authors love the opportunity they have now, and I doubt they care about the old ecosystem. They are operating in a new system, and don’t care about sales of those award winning books. I leave the last word to you! Do you mean one book per 320 Americans? One per 32 would mean there were 10 million books published per year. I suppose you can say you’re thankful we’re not there yet. Thanks for the catch, Joe. Pittance or no, people have enjoyed my writing. Hi Virginia: You make a very important point. For many writers the situation I describe isn’t important to their experience: it’s not about putting big bucks in the bank. It’s about reaching a group of readers and enjoying the synergy that results when you write your book and then connect to people who love reading good books. My only regret is that there aren’t more people who have enjoyed your writing, and the primary reason for that is the circumstance that I describe in this post. P.S. : I spent $60 at Barnes and Noble “real” book store last night for trad pub books. We have 3 Kindles in this home. My daughter spent $40. She has one Kindle. We like both forms of reading. I am on chapter 13 of a (great) thriller but the “object” seems small in my hands. All the other books are larger. I looked at the list of award winning books, and the first thing I noticed is that the genres I read most (to the tune of twenty books a month) aren’t even represented. Science Fiction? Young Adult Fantasy? Paranormal Romance? Not even on the list. Which was absolutely no surprise, since the sorts of books enjoyed by mere peasants don’t win awards. This illustrates the reason I loathe whinging about the state of the book industry, however. Somehow the argument against having a million new books always boils down to a petty complaint that now the “good” books have too much competition from “bad” books. For years, an extremely small number of people were able to control and limit what the rest of us read. Should there be any loosening of those restrictions, then those who befitted from that exclusivity will naturally cry. But for those of us who have never been able to find as many of the kinds of books as we want to read until NOW, the NEW ecosystem is far more diverse and rich and wonderful than the old desert of choices. With all due respect, you have misunderstood my argument. It’s not the nature of the winning books that I feel is important here, nor whether they were worthy winners. Only that they were books that were judged and which won prizes, and yet remain in obscurity. There are also several contests and prizes for Science Fiction, Young Adult Fantasy and Paranormal Romance. And a great many other categories. I hope that those contests are able to bring more attnetion and sales to their winners. I was and am in favor of bringing new voices to the table of publishing and I agree that the categories of books that you most favor were probably the most underrepresented several years ago: publishers made a mistake in not realizing how many readers were waiting for intriquing, complex and engaging titles in those categories. And so I agree: the addition of many new titles in those cateogies has increased diversity. But is 33 million titles diversity or pollution? Thank you for this very informative and thoughtful post. I am an author whose first novel won two national level (U.S.) literary awards, and that novel plus the next two received dozens of smaller awards. I was represented for all three novels over the years by none other than Normal Mailer’s agent. Despite that, publishers turned down the award-winning novel and the next two novels. My agent died not too long ago and I’m struggling to keep my career valid on my own. Agents are turning to something called “agent-assisted publishing” because even they cannot make a living at the job that has for so long kept them viable. I work hard to help other authors overcome these obstacles…and often that means they opt for self-publishing right out of the gate. I still believe that traditional publishers can survive but they do need to do things differently. See my subsequent post. I’m not so worried about the traditional publishers as I am about everyone else. As an award-winning author you should not become an orphan just because New York doesn’t feel like publishing you (regardless of the reason). Amazon didn’t destroy the publishing ecosystem, the progression of technology and the reader’s adaptation to that progression of technology did. We want our books sooner, in the format we want them. Amazon delivers on that. Readers, who drive this ecosystem you write about, wanted what Amazon began to deliver in 2007. To me, the publishing industry forgot about its most important asset, the reader. THAT is what destroyed the ecosystem… not Amazon. The publishing industry was VERY, VERY low-tech. That it survived as long as it did was itself unfortunate. 1) Even in 2003, queries to literary agents had to be via snail mail, with a self-addressed stamped envelope. No email! 2) Even if a manuscript is accepted, it took 12 months for the book to appear in stores. 3) Royalties of 6-12%, instead of the 70% that Amazon pays for Kindle ebooks, was appalling. Technology ensured that the consumer and content-producer won, and obsolete middlemen were removed, as they should be. I think its the evolution of the technology that affects publishing especially now that more are doing self-publishing that those traditional publishing.